Spring style this year offers something for everyone, with four key looks to choose from: Nautical, Tribal, Pastels, and Color Blocking. While following fashion could cost you a bundle, it doesn’t have to. You probably have clothes in your closets and drawers that can set you up for fashionably fabulous looks without spending a dime! Shop your closet with a friend, sister or mom and see if you already have what it takes to look great! Ahoy there, matey! Check your closet for shirts that are plaid, have horizontal stripes, or have a combination of red, white, and/or blue. Shorts are long and slim. Capris are short and tight, even better with a wide cuffed hem. Layer your tops with a tee or tank under a slim-fitting boyish blazer. Get inspired watching 80’s teen movies: look for the preppy look but ditch the shoulder pads and ignore the big hair! Animal prints are just the beginning. If you don’t have any animal prints (as many people don’t keep them lying around!) 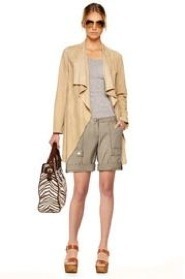 wear neutral colors (think desert sand beige, pale pink, or off-white). Accessories with hanging beads, leather accents, wooden jewelry, or eye-catching metallics complete the look. Jewelry is chunky and looks hand-crafted, so check your mom’s old costume jewelry box of stuff she never wears for hidden gems. Check out actress Keke Palmer’s style for real-life inspiration. Surely you have some light pink, mint green, baby blue or lemon yellow tees, capris or shorts in your closet. 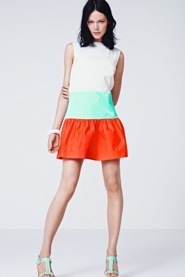 If something in your closet reminds you of sorbet, there’s a good chance it’s on trend! 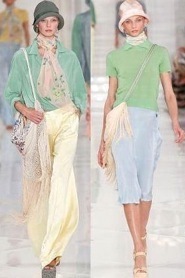 Pair un-like colors: yellow capris, a powder blue top and a light pink belt with sorbet-colored ballet flats. Accessorize with similar colors and mix, don’t match. The Mod 60’s style is all about blocks of bright, primary and secondary colors and geometrical shapes, and this spring, designers have kicked it up a notch with neons, too. You probably have a lot to choose from in your wardrobe here, so all you have to do is mix and match! Stick to no more than three main colors and work them in with your top, bottoms, shoes and accessories. Accessorize with big, round glasses (maybe mom has a plastic pair that look appropriately big and round on you), a long head scarf tied loosely at the neck, and large chunky pendant necklaces. For inspiration, look at old photos of First Lady Jackie Onassis Kennedy and the artist Mondrian’s paintings or watch the movie The Help. Do you follow fashion trends or do your own thing? Do you have any of these key pieces already in your wardrobe or are you setting off on a shopping spree for fresh looks? Best Nautical Fashion for Summer! Fashion Accessories for $10 or less!